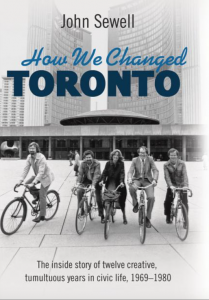 How Did the Urban Reformers Change Toronto? December 10, 2015 December 9, 2015 1 Comment on How Did the Urban Reformers Change Toronto? For more than four decades, John Sewell has been a constant presence in Toronto civic life, where he has somehow managed to combine relentless criticism of the status quo with a long record of public service. He first drew attention as a community organizer in the late 1960s, before going on to have a career in city politics, including a two-year stint as mayor. Since leaving politics he has become something of a public intellectual, with two well-received books on urban planning, The Shape of the City (1993) and The Shape of the Suburbs (2009). Applauded for his principled stands on civil liberties issues, he has also been criticized as uncompromising, combative, and—a charge he would probably agree with—anti-suburban. Sewell was just one of a group of progressive community organizers and citizen urbanists who made the jump into municipal politics in late 1960s and early 1970s Toronto. Spurred on by a surge in neighbourhood activism, they found common ground on an agenda of limiting private redevelopment, expanding public services, and increasing citizen participation in government. This was echoed by developments in other Canadian cities—the rise of the Montréal Citizens Movement, for example—prompting talk of a nation-wide “urban reform” or “municipal reform” movement. Sewell’s latest book, How We Changed Toronto (Lorimer, 2015), is an attempt to come to grips with his own role in the reform moment in Toronto. 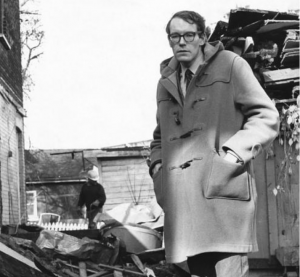 Sewell the neighbourhood activist in front of a demolished home, late 1960s. John Sewell’s photo. He’s been over some of this ground before. Sewell’s articles in the City Hall newsletter and City Magazine and his political memoir Up Against City Hall (1972) are required reading on the period. Some of the same sign-posts pop up in the first hundred pages of this book: there is the quiet Beaches upbringing, his shift from studying law to opposing urban renewal in the east downtown, and his first fumbling steps as a newly-elected councillor in 1970. But much of the material is new, and so is the tone. Sewell in 2015 is more measured and understanding than the hothead of those early years, whose blunt style of criticism made him perhaps the only councillor in Toronto history to be slapped in the face during a committee meeting (in 1972, after he called fellow alderman Horace Brown a liar). In what ways, if at all, did Sewell and his peers change Toronto? It’s a question with historical value, although not easy to answer. One obvious change was in political style. 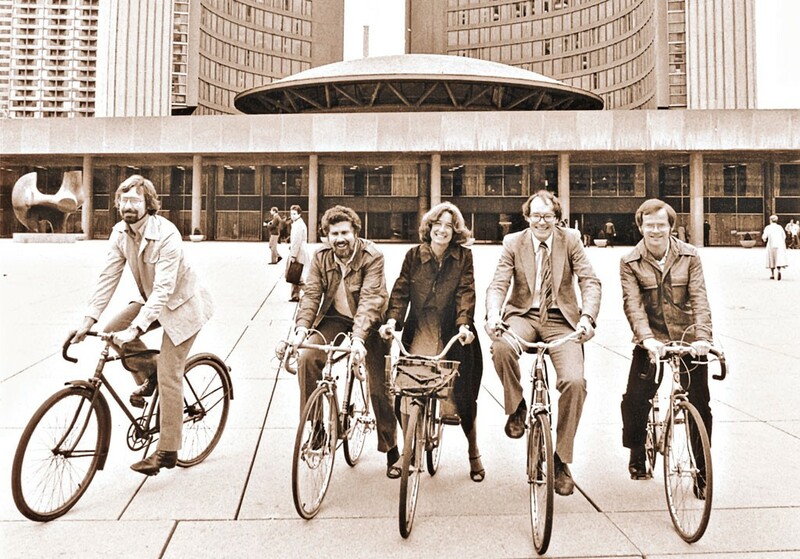 Not only did the 1970s reformers look different—they were (mostly) younger, had long hair, wore jeans, and rode bicycles—but they were committed to doing politics differently, too. The reform look, late 1970s. John Sewell’s photo–he is second from the right. In 1950s and 1960s Toronto, centralization of power never reached the heights attained in Montréal, where Mayor Jean Drapeau and a few handpicked associates held a tight grip on the reins of power. Still, many important decisions were made by the mayor and executive committee behind closed doors, city staff were unused to public scrutiny of their work, and meetings at times had the atmosphere of an “Old Boys Club.” Sewell made a very public stink about this on several occasions, reading verbatim reports of secret meetings to the press and chastising other councillors for returning to work intoxicated after the dinner break. During the reform era, council still didn’t much reflect the diversity of the city—in 1972 only 3 of 23 members were women, for example—but its decision-making did become considerably more transparent and consultative. Under two reform mayors—David Crombie (1972-78) and Sewell (1978-80)—the civic bureaucracy was overhauled and made much more responsive to council, and, by extension, voters. The main job of local government in Canada is to regulate land use. It should be no surprise, then, that 1970s reformers concentrated quite a bit of their time on planning and development issues. Many of them had cut their teeth fighting back against plans to demolish downtown communities to build apartment towers or, perhaps most famously, the Spadina Expressway, halted definitively in 1971. Once in office, they kept on saying “no!”: no to the demolition of older buildings, no to planning without community consultation, no to the automobile downtown. The effects on planning, already being transformed by new ideas from abroad, were profound. Urban renewal projects like Trefann Court (1966-1972), where Sewell got started, were halted; the new priority was to protect inner-city buildings and neighbourhoods, and engage residents in planning how to improve them. The city also launched a new affordable housing program, with the 3600-unit mixed-occupancy St. Lawrence neighbourhood (1974-79) as the centrepiece. Overall, this was a distinctly downtown-centric agenda, reflecting both the needs of an aging city and reformers’ tendency to idealize the urban over the suburban. Justice for Albert Johnson. Clara Thomas Archives. Surprisingly, given his reputation as the most difficult reform councillor, Sewell was a good mayor. Neither as popular nor as skillful at creating consensus as his predecessor, David Crombie, he was, on the other hand, utterly unafraid of taking stands on subjects that previous mayors had shied away from. As Sewell notes, pushing for police accountability was not a natural fit with the neighbourhood planning-focused reform agenda; nonetheless, it was an issue that would come to define his term as mayor of Toronto. The late 1970s saw intense public interest in a series of incidents of police brutality and discrimination: assaults of suspects in custody; a raids on the offices of gay community newspaper The Body Politic; the seemingly unprovoked (and unpunished) killing of three black men–Buddy Evans, Albert Johnson, and Michael Sargeant–in confrontations with police in 1978-79. As mayor, Sewell was an ally to Toronto’s black and gay communities as they mobilized politically, and one of the loudest voices calling for systemic police reform. Many applauded his courage; others—including the Metro Toronto Police Association—reacted with hostility, actively campaigning to prevent the re-election of a “cop hater” as mayor in 1980. A founder of the Toronto Police Accountability Coalition, Sewell has continued to pursue reform of the institution in the three decades since he left office. The problems he described in 1979 are still there, as current debates over carding and de-escalation training make clear. Quite a bit has been written about Sewell’s cohort and their time at City Hall. They and their allies were prolific while in office, and in the 1980s urban scholars spent considerable time debating their legacy. Two of their findings were that a) the reformers were a heterogeneous group defined as much by political circumstance as by shared ideas (the same might be said for the “Old Guard” they railed against); and b) 1970s reform was just the latest in a series of attempts to transform the practice of city politics. Now, with a few decades distance, it may be time for a new assessment that follows through on those lines of thinking. We need to bring in a wider range of perspectives, including not just reform councillors and their allies, but their opponents and others. How did the era look from the city’s inner suburbs, largely neglected in the major planning debates of downtown reformers? What role did the reform ethic of citizen participation play in other 1970s political mobilizations, like those of the black and Portuguese communities? We should also challenge received ideas, asking to what extent reform really meant rupture, and what its roots were in earlier developments in Toronto civil society and politics. How We Changed Toronto is not that book; it is the memoir of one man, whose voice already dominates in the literature. But it is an engaging read, and will introduce new readers to an exciting time in city politics, when transformative changed seemed not only desirable–but possible. Daniel Ross is a PhD candidate in history at York University. He writes and blogs about all things urban, from cycling activism to the 1960s counterculture. His SSHRC-funded dissertation research examines attempts to remake and revitalize downtown Toronto in the 1960s and 1970s. Read more at historiandanielross.com. Nice review, Daniel. With the renewed interest in urbanism that your scholarship is a part of we should see plenty of layers added to the story of this period.